Within the security stratum is the jurisdictional practice of physical security; however, physical security is not currently a recognised professional undertaking. Professional standing is a social recognition, designated by the public and legal arenas. Yet the physical security practitioner is instrumental in addressing security concerns. Therefore, this study extends a recent article by Coole et al. (Secur J 1–29, 2016) to articulate educational learning objectives within a formal knowledge structure. The study applied a cultural domain analysis, using security expert focus groups to develop a physical security knowledge system. Findings indicated that knowledge subjects should be aligned in order to diagnose the security problem, inference an optimal resolution and identify treatment strategies. 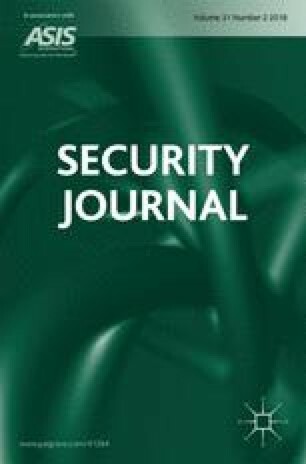 The study articulated the overarching physical security learning objectives, using a top-down structure and underpinned by subject learning objectives. The adoption of standardised learning objectives, based on clear content requisites, would represent a significant step forward in the professionalisation of the physical security professional. Australian Skills Quality Authority. 2016. Training in security programs in Australia: Report. Canberra: Australian Skills Quality Authority, Australian Government. https://www.aqf.edu.au/aqf-levels. Accessed 14 August 2017.